Where do you go when you want a quick reference on Grammar? I pull Correct Me If I’m Wrong from my book shelf. This entry was posted in authors, California Writers Club, Writers, writing and tagged books, California Writers Club, writers, writing. Bookmark the permalink. Robin – Thanks for the big mention! I am glad you like the book! I am working on the second edition of The Best Little Grammar Book Ever! But I see Strunk and White are on their 50th anniversary edition! Ha! Thanks again! You are welcome, Arlene! I enjoyed your talk at Redwood Writers last Sunday. That reminded me I could promote your books next! All of Arlene’s books are informative, entertaining, and user friendly. They make great gifts for the high school graduate who will be going off to college. Thank you, Jeanne! Yes, I agree her books make great gifts. When anyone needs that quick and simple explanation of a grammar rule, Miller’s books zip right to the point. Simplicity at its best! 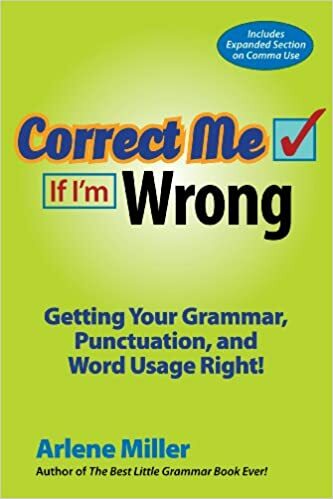 I keep Arline’s books to the right of my computer and turn to them when I’m confused or uncertain about a grammar issue. She always has the answer. Thanks, Robin, for posting this. Aren’t they the perfect reference for those quick questions about grammar? They make perfect, inexpensive gifts too.